The Administrative Codes and Registers (ACR) Section began in 1978 as an organization of administrative code and register government publishers meeting under the aegis of the National Association of Secretaries of State (NASS). In 26 of the states, the rules filing or publication function is located within the Secretary of State’s Office. In the remaining jurisdictions, the function may be located elsewhere in the executive branch, in the legislative branch, in the judicial branch, or in an independent agency. Government entities represented in ACR include most of the states, territories, protectorates, and the federal government. Currently, ACR members include personnel involved with every aspect of administrative rules. Rule editors, reviewers (from the legislative and executive branches, and independent agencies), legal counsel, and agency rule writers round out today’s membership. Non-voting members of ACR include private sector rule publishers, compilers, and database editors from various organizations involved with administrative rules. ACR holds its regular meetings in conjunction with the NASS conferences, with separate sessions and speakers, but joint meals and socials. This arrangement has benefited both organizations in terms of attracting sponsors and lower per capita costs. Networking among state rules personnel is an important objective of the conference. 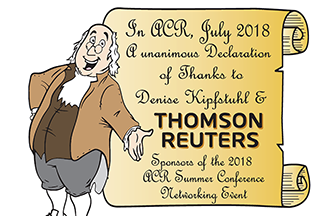 ACR sessions normally focus on legal issues in rulemaking; printing, marketing, and distribution strategies; rules review; and advances in computer and publication technology. Sessions include panels, demonstrations, and speakers of national reputation. Normally, the summer conference is held in July or August and includes about 24 hours of educational sessions attended by 70-80 members from as many as 40 jurisdictions. The winter meeting is usually held in January or February in Washington, D.C. It includes about 18 hours of sessions attended by 30 to 40 members. ACR is a national organization relying upon NASS to provide administrative support. The ACR bylaws provide for biennial election of a President, Vice President, and Secretary – Treasurer, as well as other appointed offices. The officers present a budget and program plan each year in an annual winter meeting. The organization is divided into eight regions, each with a regional representative or chairperson who facilitates communication and promotes regional conferences among the state administrative rules staffs within the region. Regional conferences, like the national conference, are supported by sponsors, usually businesses involved in the publication of administrative rules. ACR produces the State and Federal Survey, a survey of codes and registers, comprehensively documenting the operations of the state and federal administrative rules “gatekeepers,” publishers, and reviewers. Sale of the survey is ACR’s primary source of income for administration and extraordinary expenses.